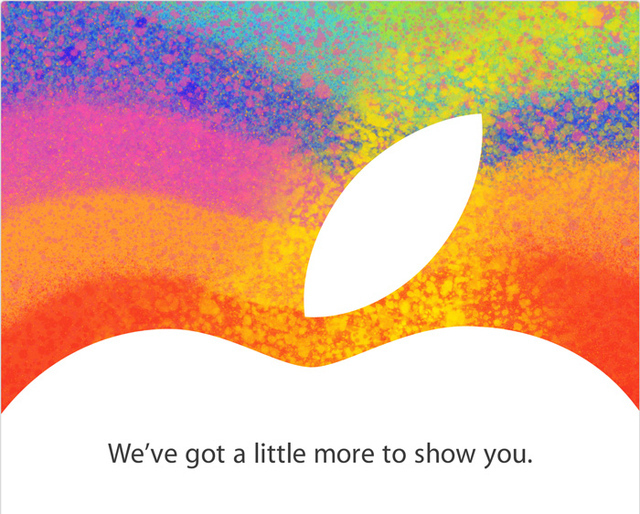 Just hours after Microsoft announced their Surface price and availability, Apple is set to announce their own tablet. On October 23 US-time, or October 24 Australian time, Tim Cook and the gang will be taking the stage and, unless rumours are wrong and Apple is just kidding around, it’s going to be a smaller iPad, dubbed an iPad mini, an iPhone pad, an iPad air, or just ‘the new bigger iPod touch’. That’s a joke, by the way. Don’t hate me. Will it not have a ‘retina’ display, will it leave the old iPad feeling left out of the new Lightning port club, or will it just be everything rumours have suggested. The time for the event is a guess, seeing as Apple usually holds events at the time listed above, however it may change. And as predicted in this weeks TECHGEEK Weekly, the next few weeks are about to get busy, so we’ll be here to discuss what’s happening on the blog and on the podcast. Stay tuned for your local team of do-gooders for local pricing, availability, and just the nitty-gritty details.